EA Play has concluded and, in my opinion, was one of the most boring conferences that I have ever seen. I was not too impressed by most of what was shown, but Battlefront 2, surprisingly, had some of the most interesting news. I made a video discussing why I thought EA Play would decide the fate of Battlefront 2, and, from what we heard, the game will continue to have added content. However, I do feel that the game is not going to receive anything too major, at least for a while. What was mentioned, though, does sound very promising and may be able to revitalize the game further with mention of the biggest map yet as well as a new large scale game mode. So, let’s go ahead and talk about what all was mentioned. I will be referring to the news received from the live EA Play event as well as a new news post from Battlefront 2's official website. The major reveal was that Clone Wars content is indeed being added with multiple levels taking place on Geonosis as well as the largest level ever added to Battlefront 2. This sounds pretty cool. A new map is always fun in any game. As I have mentioned in my previous video, though, I just hope that we will get some sort of server browser or map selector so that I can actually play these maps. As well as new maps, four new heroes will be added: General Grievous, Obi-Wan Kenobi, Count Dooku, and Anakin Skywalker. Geonosis, General Grievous, and Obi-Wan have all been leaked; so I wasn’t too surprised to see these announcements. I did not expect Dooku or Anakin, though. It is really cool to see four additional heroes being added to the game. Hopefully they will all have new and interesting abilities that can add even more variety to the different heroes and villains that are currently in the game. This content is said to be added in the fall with monthly updates being added to the game. 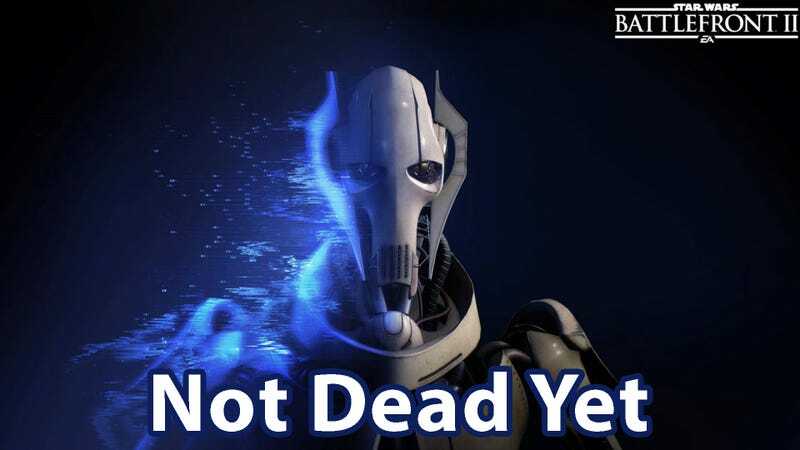 I would assume that Grievous and Obi-Wan will be added one month then we will see Dooku and Anakin added in another month. Kind of a shame that we will still have to wait for this content, but at least we have some new content with the Solo Season as well as with new updates that will arrive before the Clone Wars content. Quality of life updates, events, and fixes are said to be added on a regular basis in the meantime. July will see the addition of a hero starfighter mode. This mode is said to be a more focused approach to hero starfighter battles. There will be teams of four (like in Heroes vs Villains) with everyone beginning the game as a hero starfighter. If you are taken out, you will respawn as either a normal fighter, bomber, or interceptor (I assume you can choose your class). Victory is achieved once all enemy hero starfighters have been destroyed. What is interesting is that it doesn’t mention rounds. This could point to this game mode potentially only lasting a few minutes rather than several minutes. Ewok Hunt has seemed to have a lot of success and featured matches that only lasted around five minutes. Maybe the game is headed more toward modes with shorter match times. I think this new mode may have the potential to be very cool for me even though I am not a huge fan of Starfighter Assault. I find the mode to be too grindy and unfocused. Having a smaller scale space battle could be a lot of fun as you have to worry less about random encounters and focus more on intense dogfights revolving around less ships. What I mean by random encounters is the plethora of times that I turn around to face one or more enemies or objectives only to be destroyed within seconds by one or more starfighters that I didn’t even see. I feel that this new mode will have a more Star Wars feel to it which I do not currently get with Starfighter Assault. The livestream also points to a new squad system being added this summer which will allow for easier play with friends. Battlefront has always had a problem with squads ever since Battlefront 2015 introduced the buddy system and Battlefront 2 introducing the random squad creation system. The news post mentions spawning directly onto squad mates. I am not sure how well this will work since Battlefront 2 can tend to be more chaotic than Battlefield games. Imagine spawning on a buddy before getting rushed by Darth Vader. I do think it worked fairly well in Battlefront 2015 as well as the Battlefield games; so maybe the restrictions on spawning on buddies who are in combat will be added to this game as well. Since it is a gameplay mechanic that has been tweaked so much with the Battlefield series, I am sure that it will work very well. We also got a mention of a new non-linear large scale mode being added later this year where players will fight for control of objectives. The livestream mentions that you will be capturing command posts and attacking and destroying capital ships. This is by far what I am most interested in and have been wanting since the game’s release. It is a shame that it will almost be a year after the game’s release before we get a non-linear big team battle, but at least it is coming. There are a couple interesting things about the words mentioned when describing this mode. Command posts were specifically mentioned and were what players fought over in the original Battlefront games. I am sure most of you who also played Battlefront 2 2005 can hear the different announcer voices in your head right now talking about command posts being captured and lost. Another interesting mention was fighting for the destruction of capital ships. Capital ships were fought over in the space battles of Battlefront 2 2005 as well as in a PSP version of Battlefront which actually saw you fighting to control large laser cannons which fired up into space at capital ships. This PSP game also allowed you to get into a starfighter and travel to space above the battle on the ground and fight in a space battle between the capital ships. The space battle was reliant on the ground battle and vice versa. There were a couple mentions of the original Battlefront games in the live stream. I honestly doubt that we will have simultaneous ground and space battles (especially considering the amount of processing power it takes to run the game), but imagine how cool something like this could be. This would truly be a large scale battle and something that we haven’t really seen in multiplayer gaming recently. Not that many games offer the chance to engage in massive battle scenarios of this scale. But, even without a mode like this, I think that finally having a non-linear game mode will be extremely refreshing for the game. I for one am burnt out with the attacking and defending nature of Battlefront 2 and want more diverse and interesting battles that are only available in non-linear battles. I have been playing Conquest more in Battlefield 1 and have had the best time being in games where both sides are fighting for the same objectives. It really gives you a greater sense of focus as you realize that your opponents are trying to best you at the same exact thing that you are trying to accomplish. This is how games have worked for centuries. Look at chess for example. Can you imagine if one player had to take out the king while the other just had to defend the king with no real way of taking out the opponent’s king? It would be extremely boring and not lend itself toward more varied gameplay involving attack and defense. Finally having a push and pull game type in Battlefront 2 will be great. And, that is about all of the news that we got from EA Play concercning Battlefront 2. This announcement was honestly one of my favorites of the entire event. EA Play this year was pretty boring in my opinion; so I was glad to see that at least Battlefront 2 had something to discuss that sounded promising. It would have been nice to had seen actual gameplay and what not, but I would have hated to take up the time spent listening to a football player discuss an esports competition that I didn’t even realize existed as well as watch a mobile game for around five minutes. That was definitely as good as hearing the title of a new Star Wars game as well with not even a logo to back it up. We definitely didn’t need to learn more about Battlefield V, what you actually do in Anthem besides fighting monsters, the future of Battlefield 1, or see Battlefront 2's newest additions. And, speaking of Battlefront 2, I think that it has the potential to become something great, and I hope that the game will be able to deliver the “Star Wars Experience” that it promised in last year’s EA Play event.